When you're fourwheeling, getting stuck on the trail is part of the adventure. It's kind of part of the point of wheeling in the first place - conquering unconquerable obstacles. We all still want to get unstuck also! No one wants to sleep in their truck or leave it on the trail overnight. This can be one of your single-most important pieces of recovery gear if you don't have a winch. If you do have a winch, you can pair them together to make your off road recovery options go smoothly. In this article, we'll take a quick look at the specs and applications of 6 models of Hi-Lift Jacks. You can't do this with a bottle jack! Frankly, for fourwheeling, we're most interested in the lifting and winching motions. 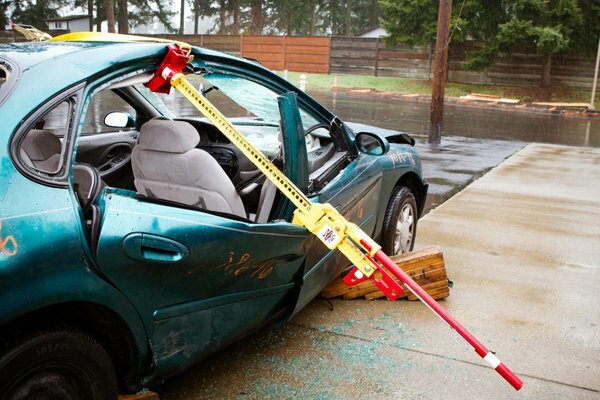 If you think your Hi-Lift can't do something, take a look the the available Hi-Lift Jack accessories. Chances are that you can find a way to make your jack work better with a bolt-on mod. 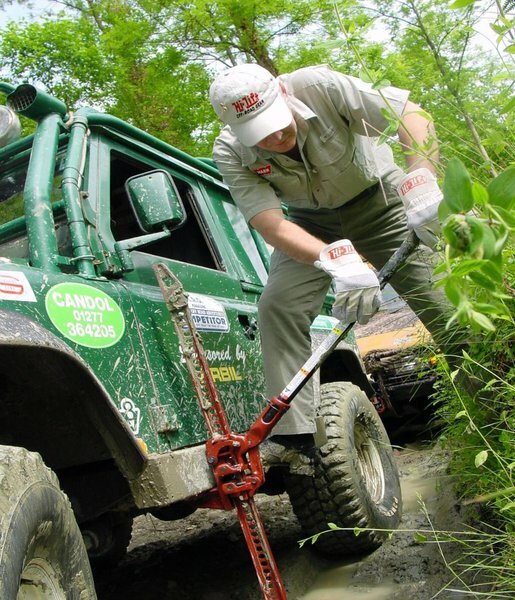 Jacking up a 4x4 is the most common use of a Hi-Lift on the trail. Most wheelers use it to reseat a bead, change a broken axle, or some other thing that requires a corner of your rig to be in the air. The Lift-Mate lets you lift directly at the wheel so that you don't need to max your suspension. The Off Road Base keeps your jack from sinking in the soft stuff. Factory jacks and bottle jacks just don't cut it. They're too short: You might be able to use your bottle jack on pavement, but add taller tires and uneven terrain and it'll almost never work for you off road. And no, rockstacking under a bottle jack is not a solution. The jack needs a stable base, not a tower of uneven rocks. You have to get under your 4x4 to use them: We advocate not going under your 4x4 if you're jacking it up off road. It's a safety thing we have about minimizing risk, kind of like "Never turn the key without your seatbelt on." You're usually a little stressed, the rig isn't on level ground, and if you feel rushed you're likely to make mistakes. And our last point really highlights when we think people should really be using a Hi-Lift. Being able to lift a tire, or two, or all four, then stacking rocks, boards, or logs underneath can quickly get you out of a jam. It's a simple technique that is made easy by the design and amount of travel you get in a Hi-Lift. And if you have a winch? Well, this makes winching even easier. Have you seen people struggling to winch out of a hole or against an embankment or a rock shelf? Sometimes they keep on winchin' and break a winch cable. With a Hi-Lift, you can give yourself some advantage by lifting a tire, stacking some rocks, and continuing to winch. This is easier on your rig and your winch (this is doubly true if you have a cheap winch like the Smittybilt XRC 9500 - gotta baby it). The winch gear attaches quickly and easily. The hanging chain near the jack base secures the jack while you reset it at the end of the bar's travel. A Hi-Lift Jack working as a winch simply isn't as good as a real winch, but it shines as a stabilizing device in tricky off-road situations where a winch alone isn't enough. You can winch up to 5,000 lbs with your Hi-Lift if you have the right setup. Hi-Lift sells a winch kit to make it easy. If you're careful and use the appropriately rated steel and chain, you can make your own Hi-Lift winch kit. The one that Hi-Lift makes is designed to allow the Hi-Lift to "travel" along a piece of chain. Each time you use up the length of the jack, you place a clevis hook on the pull chain, take the tension off the jack's nose, and reset it. If you don't make or use the short tension chain assembly at the base of the jack, you can't reset it without completely stabilizing and securing your 4x4. The large runner, nose, and lifting mechanism have the same capacities across all jacks. The base is similar on all models except the First Responder. The bars have similar capacities, except for the upper sections on the 60" bars. Most Hi-Lift parts are shared through the different models, which is why a UTV jack is specced mostly the same as an all-cast jack. The primary difference in weight capacities through Hi-Lift models is whether the jack comes with the heavy-duty top clamp clevis. If you already have a Hi-Lift, you can get similar gains and more functionality by using a Jack-Mate. 7,000 lbs. 7,000 lbs. 7,000 lbs. 7,000 lbs. 7,000 lbs. 7,000 lbs. Max permitted weight up to 48"
5,000 lbs. 5,000 lbs. 5,000 lbs. 5,000 lbs. 5,000 lbs. 5,000 lbs. This ultra-strong clamp-clevis is used on the X-TREME, the First Responder, and the UTV jacks. It can hold more weight than the typical clamp-clevis and it has a chain slot. All Hi-Lift Jacks have a shear bolt that breaks at 7,000 lbs. The UTV jacks have the same strength as any other Hi-Lift. 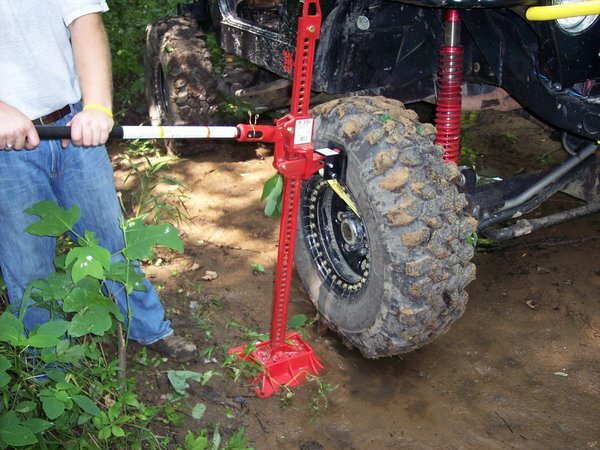 The Xtreme, First Responder, and UTV jacks all have Hi-Lift's high capacity top clamp clevis. Hi-Lift actually says that the high capacity clamp clevis can be used to the jack's max weight. However, we think that realistically, it's going to be difficult for many of us to generate the required force on the jack handle. What happens when the shear bolt breaks? Probably not much. The climbing pins will still hold the load. You'll have to replace the bolt with one from the Hi-Lift Fix-It kit and figure out how to run your load differently. The most confusing thing for many people is what length Hi-Lift you should buy. Your primary concern is probably running out of jack before you get the job done. It hooks on to your wheel so that you can jack directly at the wheel instead of maxing out your suspension then lifting the wheel. It's a lot safer than jacking the bejeezus out of your rig. All Hi-Lifts have the same minimum starting height: 4.5"
Check out our chart for the maximum lifting heights for each jack length. For most offroaders, we'd pick the 48" or 60" jack. We see the 36" and 42" jacks as okay for UTVs, ATVs, and some stock 4x4s. If you're you're really in doubt, 48" is probably the most common choice and is plenty for most rigs. If you have bigger tires and a lift, everything is going to be further from the ground. A flexy suspension only makes it harder to get your wheel up. Using your jack at your bumpers and sliders is pretty common, so make sure you can reach them with whatever jack you get and still go higher! If you have a bumper mount that stands your Hi-Lift up, it can protrude above your roofline and catch on branches. 60" jacks are awesome when you have a rig with a lot of travel. 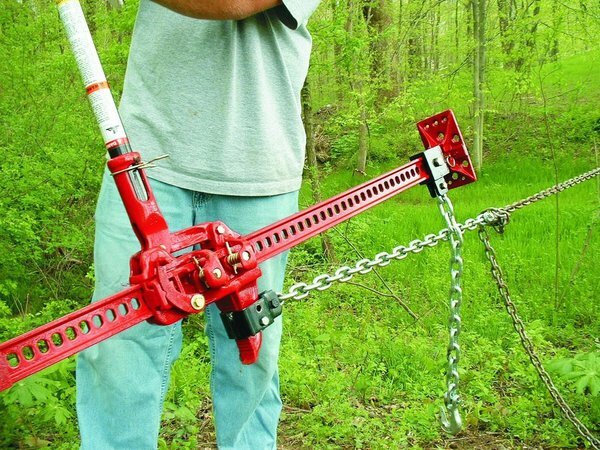 If you plan to winch with your jack, you'll reset less frequently with a 60". You can always cut down your 60" jack if you're not using all its length. Many people think that the all-cast jack is "stronger" than the cast-and-steel jack, but that isn't exactly true. 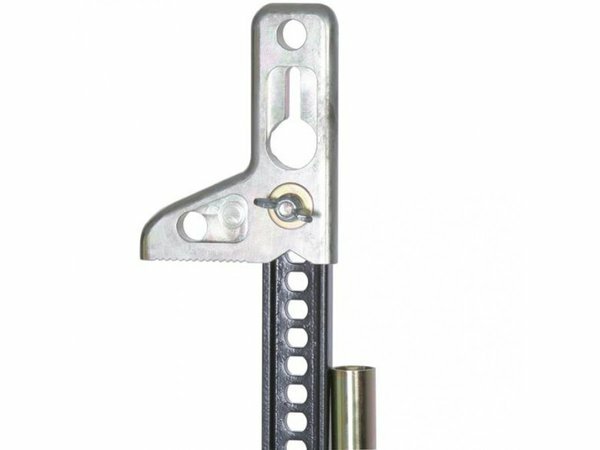 The cast-and-steel Hi Lifts use 4 steel parts that are cast in the all-cast jacks. The cast-and-steel jacks have the exact same weight capacities as the all-cast jacks. The only difference between them is wear. The cast-and-steel jacks will wear out more quickly over time than the all-cast Hi-Lifts. The cost difference is pretty minimal between the two. And yes, Jenna, when you try to save a few bucks by buying the cheaper jack for my birthday when you don't even know which is better even though this is life-saving equipment, I know. The nose, handle, handle socket, pitman, runner: after a while and with enough use, everything rusts on a Hi-Lift. There is almost no way around this unless you just live in a place where steel doesn't rust. So why do they rust and how we can slow it down? This jack is all steel and steel rusts. Good stainless steel and aluminum don't rust but neither would be able to support the weight that a Hi-Lift jack can. When you use your Hi-Lift off road, the large runner will scrape some finish off the bar (this is the long 36", 42", 48", or 60" piece) at the points of contact. The same goes for the handle pivot, the climbing pins, the springs, and all the other parts that make the jack work. It's metal on metal contact, so there isn't any way around this. But we're all wheelers, right? The Hi Lift Jack is a tool that we use off road, and our tools get a little banged up if we're using them. 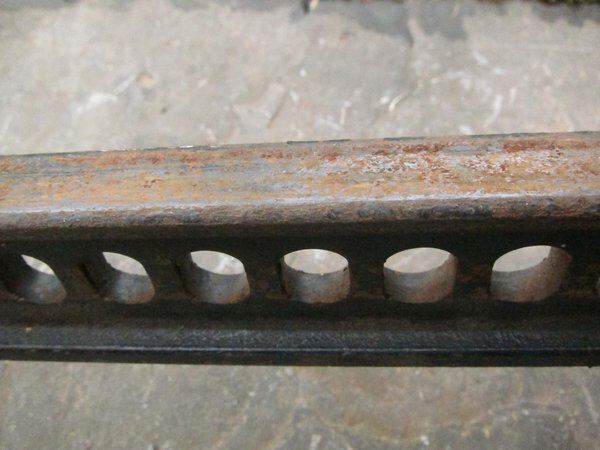 This is completely typical wear on a Hi-Lift bar after a few years. You can't avoid it - it's metal on metal contact. Keep the climbing pins, springs, pivots, and lifting mechanism coated in penetrating oil. Store it inside your rig. Spray bomb it every once in a while. We also always suggest bringing a cheap Fix-It kit with you on the trail. If your jack's climbing pins are rusty, they'll bind - this is very unsafe. This is a common problem on the trail and is one complaint people have about their Hi-Lifts. Frankly, if you have this problem, it means you aren't keeping things lubricated enough. You can replace rusty climbing pins on the trail easily with the Fix-It kit and some tools you should already have. So, for a 60" Xtreme cast jack, we get: XT-605. For a 48" First Responder cast jack, we get FR-485. You can't just put part numbers together willynilly, but chances are, if you want a combo, you can come up with something that works for you. Which Hi-Lift should you buy? If you just want a plain Hi-Lift go with the 48" all-cast or cast-and-steel jacks. If you have a flexy suspension or want the extra travel, get the 60" version. Of course, there are more options, like more strength, colors, or functions. The all-cast jack is the classic Hi-Lift. The cast parts will last longer than the steel parts in the cast-and-steel jack. Want the good ol' standard Hi-Lift? The all-cast Hi-Lift jacks are made of all cast parts. Since cast parts are harder than steel, it'll take longer to wear out than the cast-and-steel jacks. These jacks are all red. It comes in 42", 48", and 60" lengths. The factory top clamp-clevis is the "weak" one that can only clamp up to 750 lbs. If you're choosing between the all-cast and the cast-and-steel, the all-cast is better and the prices are often almost exactly the same. These are supposed to be the "cheaper" Hi-Lift, but they're only a few dollars less than the all-cast. They are just as strong as the all cast, but the steel parts will wear more quickly. Sometimes you can save a few bucks over the all-cast version of the Hi-Lift by getting the cast-and-steel version. While the all-cast version should last longer, for the average wheeler it probably doesn't matter to much. The all-cast and the cast-and-steel have exactly the same weight ratings and capacities. The only difference is the wearing of the parts, and that the cast-and-steel comes in black. 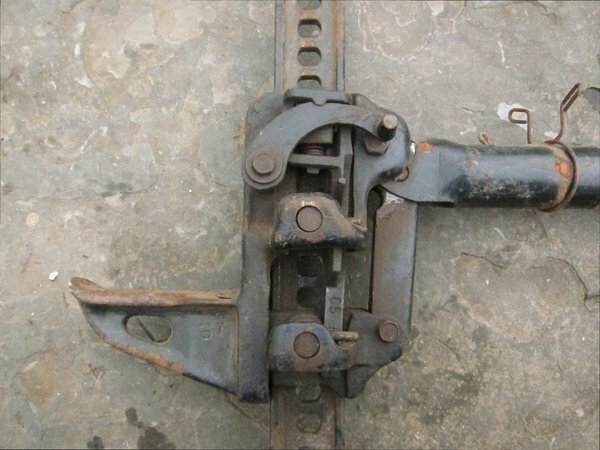 Like the all-cast, it comes with the "weak" factory clamp-clevis. Unlike the all-cast, it comes in one more size - so you can get a 36", 42", 48" or 60". The red, white, blue Patriot is all-cast and comes with a handle isolator. A portion of the proceeds from this jack go to charity. Want to help out a good cause? The main jack assembly is powdercoated blue. The handle is powdercoated white. It includes a red handle keeper, which usually runs around $10 or so. The powdercoating should help with rust and be a little more durable than the paint on a normal Hi-Lift. Our red jack's finish lasted longer than our black jack's. We're hoping that the Patriot can do even better. With each sale of this jack, Hi-Lift also donates to Hope for the Warriors, a nonprofit group that helps veterans and their families. If you want to do some good and sport some red, white, and blue, the Patriot is the jack for you! The Patriot comes in two sizes, 48" and 60". Besides the powdercoat finish and the gold-zinc plated hardware, the biggest improvement that this all-cast jack makes is the super strong top clamp-clevis. If you're tired of the seeing red and black Hi-Lifts and you need something a little beefier, this is your Hi-Lift. The bar, runner, and base are all powdercoated in a charcoal metallic finish, while the handle is powdercoated gold. The paint on regular Hi-Lift jacks comes off pretty easily. We're not expecting this survive metal-to-metal contact forever, but powdercoat should kick up the longevity a notch. The two things we really like though, are the top clamp-clevis and the hardware. The top clamp-clevis is a stronger version that is meant to fit in one position. The all-cast clamp-clevis, for instance, flips up or down whether you want to use the jack in winch or clamp mode. This is the jack you should have gotten for my birthday, Jenna. The X-TREME version is thicker, bigger, and stronger than the standard clamp-clevis. Plus, it has a hole and slot to take a chain. This makes it even easier to winch with your Hi-Lift. The hardware on this jack is gold-zinc coated. Typically, Hi-Lift hardware starts to rust pretty quickly. This hardware will rust eventually too, but it should take a lot longer than the regular stuff. This jack comes in 48" and 60". These smaller jacks are perfect for UTVs and probably some stock 4x4s as well (although we recommend 48" for most 4x4s). The UTV jacks are little jacks with big features! Although they are sized to fit on a UTV or a side-by-side, they're still made from the same components as other Hi-Lifts. That means they still have the same weight ratings and capacities! These jacks also come with the same top clamp clevis that's on the X-TREME jack. We don't know why Hi-Lift put it on here, but we're glad they did! 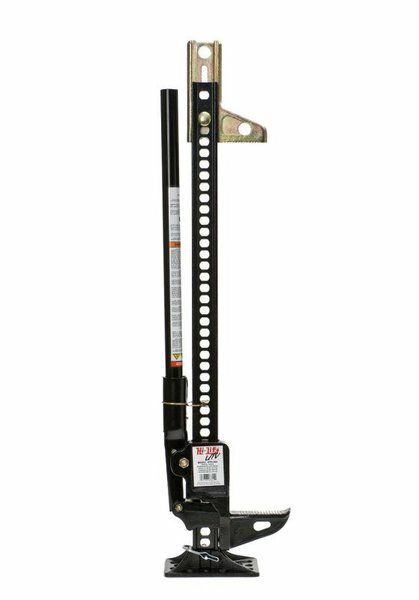 The UTV Hi-Lift jack is available in 36" and 42" and is cast-and-steel. This is the First Responder in its element. Note the top-clamp clevis and the swivel base against the roof. The First Responder is really intended for fire fighters and other first responders. It has the ultra strong clamp-clevis at the top and a specialized base that swivels. Now, you probably aren't going to get this jack - it's a little crazy. The First Responder Jack comes in 36", 48", and 60". It has a bright yellow and red powdercoat finish, plus some glow-in-the-dark tape to make it easy to see in the dark or at night. First, it has the strong, heavy-duty top clamp-clevis, like the Hi-Lift X-TREME. But the biggest difference is the base. The base is sort of a heavy duty upside-down reinforced channel. Most of the pictures you find of this jack show it being used in car rescues where the steering column has collapsed, a door won't open, or a roof is crushed inward. The channel base is well-suited to catching where it needs to to prevent the jack from slipping. The base also swivels and locks into place so that it can be placed in the optimum position. We wonder if maybe a base like this could come in handy off road, but it would add some size and weight to your off road recovery kit.